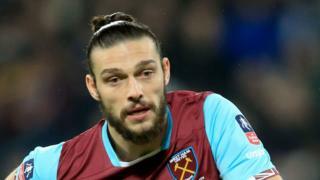 West Ham striker Andy Carroll has told a court a gun-wielding motorbike rider tried to rob him of his £22,000 watch. The footballer, who has nine England caps, told Basildon Crown Court he was returning home from training when he was chased by two motorcyclists. He said one rider pulled alongside him at the traffic lights and demanded his watch. They followed him as he drove off, and one made gun signs at him. Jack O'Brien, 22, denies attempting to rob the 28-year-old on 2 November 2016. In a frantic 999 call played to the jury, the Premier League player said: "There's two motorbikes, one's behind me pulling out a gun, I don't know what to do." As beeping is heard in the background, he swears and tells the operator: "I've hit loads of cars, I don't know what to do, he's just hit my car." He eventually arrived at the West Ham training ground where he told the operator there were security staff there. "I've probably just hit about 10 cars on the way here," he said in the call. The court heard the bikers had approached Mr Carroll at traffic lights on Romford Road in Hainault, north-east London. The player told the jury: "I just pulled up at the traffic lights, my window was open, a bike pulled up next to me and said 'Nice watch'." He said he replied "thanks" and thought he recognised the man on the motorbike. "He had his crash helmet on with his visor up," he said. "I stared at him for about 10 seconds as I thought I recognised him and thought he was going to have a conversation." He continued: "I went to drive away and he said 'Give me your watch'." Mr Carroll said he was not sure if it was a joke, but when he did a U-turn, both riders turned and followed him. The footballer added: "I was scared, I didn't know what to do. "I called my partner's dad, I just panicked. "He told me to ring the police." Prosecutor Simon Gladwell said the footballer was "beeping at other cars and driving on the wrong side of the road to get away". Mr Gladwell said the motorbike rider "repeatedly pointed at him with a gun," or pretended to have a gun and demanded to have his client's watch. Forensic scientist Luan Lunt told the court that DNA found on a crash helmet and Ducati motorbike jacket linked to the incident matched Mr O'Brien's. The chances of that DNA originating from anyone else was "one-in-a-billion", she estimated. During cross examination, she said she could not give a specific time or date as to when the DNA was left on the items. Michael Edmonds, defending, said Mr O'Brien, of Navarre Gardens, Romford, east London, was not the motorbike rider. He said the defendant had used the bike, jacket and helmet for crime before, but it was not him using the motorbike on this occasion.